When I began putting together thoughts for this latest post it was initially going to be a one-blog piece, however I soon realised that I had bitten off more than I could chew and in order to do it justice (and not bore you all with a 10,000 word essay!) I needed to break it out into a number of parts so I’ve decided to look at it regionally, splitting the country into two: the North and Central Italy, and the South and Islands. Italy both fascinates and frustrates me in equal measure. In terms of sheer number of varieties and more to the point, the number of indigenous (often ancient) varieties that are grown here, Italy stands atop of the pile. However, it is also possibly the most frustratingly complicated country to try and explain given the vagaries of the classification systems and confusing use of naming conventions. What I will try and do in these blogs is highlight the grape varieties behind the wine names and give a high level overview of the style of these wines and what to look for on the bottle, the rest as they say will be up to you to explore. As a disclaimer I would like to point out this article is by no means definitive, its aim is to (hopefully) cover off some of the more common wines found in the high street and your local wine merchants and give a bit more of an understanding next time you are perusing the shelves. From entry level table wine to IGT, DOC and DOCG wines. Main things to note, DOCG followed by DOC have the tightest regulations ie around use of grapes/production methods/ageing requirements. Note: Don’t automatically assume all wines exhibiting DOCG are the best, some IGT wines (free from the confines of grape variety and other restrictions) can produce outstanding wines – the Super-Tuscans are prime examples here. By Name – ie a Super-Tuscan such as Tignanello. Note here these are usually IGT (IGP) wines as they include international varieties and don’t conform to the grapes classified for use within the DOC/DOCG regulations. “Classico” – meaning it has come from an historically defined region (often hillier with ideal conditions for grape growing!) with DOC or DOCG status ie Chianti Classico. “Riserva” which has been aged for longer and is slightly higher in alcohol. “Gran Selezione” – the new top tier classification introduced to the Chianti Classico DOCG in 2015. As I sense I may be losing some of you now let’s park this section and get on to the wines themselves. Despite the huge number of varieties grown, when most people think of Italian wines I suspect only a few names come to mind: Prosecco, Chianti and possibly Barolo and Amarone …am I right?! Hopefully after reading this you will have a few more names to add to this list. Nebbiolo – Rarely seen outside Piedmont this is widely considered Italy’s star grape: producing lightly coloured high acid red wines, the best of which exhibit classic floral (rose, violets) and tar aromas, but don’t be fooled by the colour it belies the ferocity of the grape’s tannins, which need many years to soften into approachability. The best known (and most premium priced) wine from this grape is ‘Barolo ’. You can also find more attractively priced wines: ‘Barberesco’, ‘Gattinara’, ‘Spanna’ and wines entitled ‘Langhe Nebbiolo’. Barbera – this is the name of the grape not the wine so don’t get confused with ‘Barberesco’ (see above) although also found in Piedmont (amongst other regions) it is not the same grape. Barbera is an altogether more approachable grape than Nebbiolo: whilst equally high in acid it is conversely low in tannin, less aromatic (black fruit) and rewards earlier drinking. Dolchetto – another Piedmont red, this one is best known in the wine of ‘Dogliani’. Fruity, deeply coloured, low in acid but high in tannin, wines tend to be best drunk young. ‘Valpolicella’ – dry relatively light bodied sour cherry flavoured early drinking high acid wine. the higher alcohol slightly richer ‘Valpolicella Ripasso’ – which I think of as being “Amarone-lite” essentially it is produced by taking a basic Valpolicella and re-fermenting it with the skins from grapes used for Amarone production. the mighty, dry, full bodied richly flavoured delight that is ‘Amarone’ (or to give it its full name Amarone della Valpolicella ) full of bitter chocolate, prune, mocha and sweet spice. The Passito method is used which involves taking ripe grapes and drying them out on mats, the dehydration concentrating the sugars. Amarone is fermented to dryiness hence the high alcohol and big body. I’m a big fan of this wine, it’s one of my favourite reds when done well but it’s definitely not shy; fans of delicate reds should probably avoid! ‘Recioto della Valpolicella’ gorgeous medium bodied sweet red wine that is full of chocolate notes and dried fruits. Same technique as Amarone except the wine isn’t fermented to dryiness, so it is both lower in alcohol and much sweeter. Sangiovese – its best known iteration is in Tuscany as ‘Chianti’ – made predominantly although often not exclusively from this red grape. 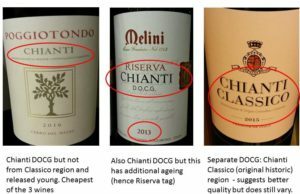 I have a big problem with Chianti and won’t go into the whys and wherefores of the flaws around the IGT/DOC/DOCG system but there is a hell of a lot of VERY average wine out there masquerading under the DOCG classification! As such you are probably best to look for quality producers instead – Antinori and Banfi are widely available and reasonably priced. You also find ‘Brunello di Montalcino’ and ‘Vino Nobile di Montepulciano’ also made from this grape in this region. 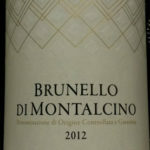 I prefer Brunello personally – its bold, high acid, chock full of black and red fruit but do note the big tannins (it’s aged the longest of all Italian reds) so warrants some ageing to mellow everything down a bit! Both of these wines tend to be on the premium priced end of the market, but both have lower priced yet good quality second wines which use the prefix ‘Rosso’ di Montalcino/di Montepulciano. Whilst looking at these Tuscan reds I want to mention “Super-Tuscans” – these are wines which are super premium (and thus super priced) made originally from a blend of grapes driven by International varieties Cabernet Sauvignon, Merlot and Cabernet Franc. Originally existing outside the IGT or DOC system due to grape varieties used they first came to prominence in the 1970s. Wines such as ‘Sassicaia’ and ‘Tignanello’ are two premium examples. If you have big wallets, feel free to explore and enjoy these. Montepulciano – best known for ‘Conero’ or for more entry level wines such as ‘Montepulciano d’ Abruzzo’ (ie from the region of Abruzzo) WARNING – this is NOT the same grape as used in Vino Nobile de Montepulciano (See I told you it could be a bit complicated, just when you think you were understanding it…..!) This grape produces full bodied relatively easy drinking deeply coloured red fruit driven high acid wines. Sangrantino – grape found mainly in Umbria. Another wine that isn’t shy, full bodied, high in alcohol and richly flavoured with an abundance of black brambly fruit, smoke and a fair whack of tannins. Whilst it is not that common on the High Street here in the UK it is definitely worth seeking out (Waitrose wine cellar does one for £14.99). Whilst the UK market tends to be awash with Italian Pinot Grigio – a lot of it of very variable quality – I look for wines from the Alto Adige region for more aromatic versions. As I will be writing a piece of Pinot Grigio/Pinot Gris in a forthcoming blog I am going to skim over this grape and concentrate on lesser known wines. Gargenaga – responsible for the major component of the best known of Veneto’s whites’: ‘Soave’. When yields are limited this can be quite characterful: fuller bodied, apples, pear and characteristic Camomile notes. Mass production produces cheaper, lighter bodied blander wines. Vernaccia – the only white only DOCG in Tuscany. Best known for ‘Vernaccia di San Gimignano’, similar to a lot of other Italian wines quality varies within the DOCG, the best have lemony notes, some stone fruit, decent acidity and minerality and a touch of nuts on the finish. Verdicchio – its best iteration being ‘Verdicchio dei Castelli di Jesi’ in the Marche region. Straw coloured, high acid wine with apple notes with slightly bitter almond characteristics. Pecorino – yes this is a wine, and a cheese! Apparently it was so named because sheep were quite partial to giving the grapes a bit of a nibble…but I digress, this is another in the “high acid, straw coloured, floral” range of Italian whites. Cortese – one of the key whites of Piedmont in the guise of ’Gavi’ and ‘Gavi de Gavi’. First thing to clear up here is what’s the difference? Essentially wines can only call themselves Gavi de Gavi if they actually come from vineyards within the town of Gavi…simple! Flavour characteristics here are white flowers, lime, apple and yes there is again…a hint of almonds on the finish. Arneis – another Piedmontese white which is minerally, structured with a fuller body and more citrus, pear and stone fruit in character although still with hints of nuttiness. Moscato – also found predominantly in Piedmont where it makes aromatic grape and orange blossom scented lightly sparkling ‘Moscato di Asti’. Trebbiano – widely produced across central Italy and very much seen as the work-horse grape although if I am being accurate I should say grapes plural given there are a family of different grapes with this name and the wines produced from them vary wildly – generally though they are high acid, light bodied with quite neutral flavours (note: in France called Ugni Blanc where its best known for making Brandy!) Better wines purported to contain Trebbiano include ‘Lugana’ which uses the Trebbiano di Lugana clone and these are definitely worth seeking out over basic Trebbiano. Note the better known ‘Frascati’ is made from a blend of Trebbiano and Malvasia. Finally, a word on a more unusual Italian white – I’ve banged on a lot about delicate fruit, nuttiness and flowers, well, there is one wine that the Alto Adige region of Italy does particularly well, which is the aromatic Gewurztraminer aka Traminer. Some of these are cracking, lots of aromatic lychee fruit and an abundance of character usually with a touch of residual sugar. Great stuff. Next week – Southern Italy and the Islands, and there are some terrific wines and bargain prices to be had from these regions so look out for this blog. Fantastic blog Sam – I’m in awe of your knowledge! Reminds me of a time in Rome when we put our trust in the owner of a small restaurant we were visiting and asked for help in choosing the wine to compliment our food – it was amazing (still have no idea what it was – it was just delicious!). Think I’ll have to “text a friend (you! )” the next time I’m dithering in the wine aisle or perusing a restaurant wine list! Brilliant blog! Thanks! Enter your email address to subscribe to our blog - it's free and you will receive notifications of all new posts by email.